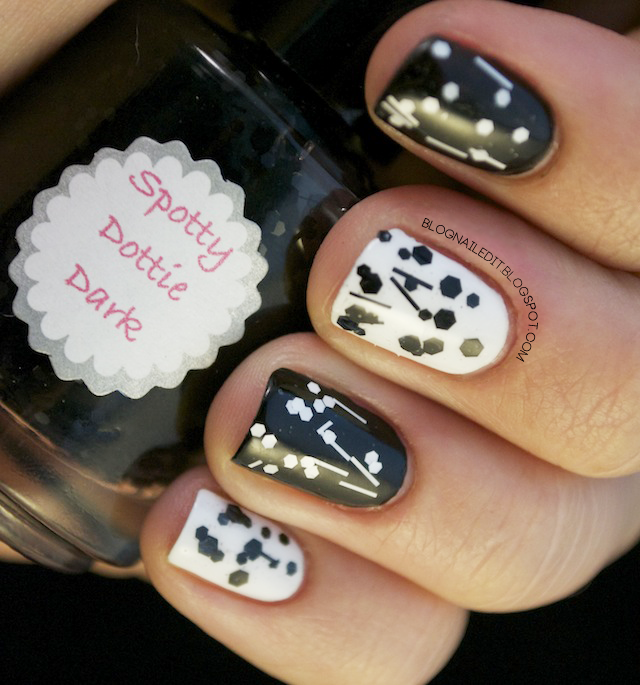 I wanted to do something really out there with the Spotty Dottie polishes I bought not long ago from All That Glitters, but like many girls recently, I have fallen prey to the deadly grip The Hunger Games has on us. It's like the black hole of books; the chapters keep sucking you in. I've already given up an all-out-there design for this book. I'm sure sleep isn't far behind. The good news is, after working on this manicure I'm showing you today, I'm glad I didn't dedicate more time to a more trippy design. What all the stripes and dots of glitter reminded me of on top of Black on Black (Sinful Colors) and French White Creme (Wet n' Wild) were music notes as they're written on a page, broken into little pieces. It's too bold to be cookies and cream, and the spots are too precise to be dalmatian spots. I loved the effect these glitters eventually gave, but getting them to this point was a pain. Unfortunately, the ratio of clear polish to glitter was off, so I wound up with thick layers of polish, without much glitter. I think this polish would've benefited from being either sold in a smaller size, or packed with more glitter pieces. As it is now, it's a little frustrating, especially the white. These glitters look absolutely gorgeous, maybe you should try filtering out some of the clear polish to make it easier to work with? Good call, I'll see what I can do about that. Thanks! A very interesting idea, it's come out great! Whoa... these come in BOTH ONLY WHITE AND ONLY BLACK? !